This plate shows a woman and a girl (perhaps a mother and daughter) seated in a domestic [garden] setting. Le Follet Courrier des Salons Journal des Modes (1829-1882) was one of the longest running 19th century fashion magazines. Initially specializing in scenes of ladies at the opera and soirees, all the best fashion plate artists worked for Le Follet in the 1840s and 50s and the high quality of Le Follet plates is a testament of their skill. Later issued in English and American editions, from August 1830 Follet plates were subtitled ‘Modes’ below the image with the title ‘Lady’s magazine’ varying several times between 1832 and 1838. The woman in this image wears a sky blue dress of ‘mousseline’ (a fine light woollen cloth of a muslin-like texture) with large balloon-sleeves, tight-fitting from elbow to wrist trimmed with pointed gauntlet-style, ‘white work’ embroidered cuffs extending over the hands, and a wide low cut neckline, in-filled with a fine muslin ‘chemisette’ or habit -shirt with a pleated, ruffle collar standing above a black [satin] ribbon tied in a bow. The dress has a plain, smooth fitting bodice above a round waistline, worn with a tan-coloured ornamental apron of embroidered ‘Gros de Naples’ (type of Italian silk with a ribbed surface) with patch pockets and edged with cord which has been wrapped around the waist, the knotted and tasselled ends dangling decoratively in her lap, over a full skirt reaching to just above the ankles revealing cloth walking boots with narrow, square black leather toe caps. She has a floral printed shawl draped over her right shoulder and her hair is arranged in an elaborate coiffure with bunches of side curls and a high bun with a corsage of wheat. The child is seated on an X-frame stool and wears an ensemble of matching dress, cape and pantalettes made of yellow ‘Jacconnas’ (sic) (Jacconnet: a thin cotton fabric like muslin) with balloon-sleeves, tight-fitting from elbow to wrist, the ruffled collar of a chemisette or habit shirt is visible at the cape neckline tied with a dark pink ribbon. She wears blue cloth walking boots with narrow, square black leather toe caps and her dark hair is plaited and coiled into a bun with bunches of side ringlets. One of the manufacturers named on this plate is listed at a fashionable address on the Boulevard Italien; running east west between the 2nd and 9th Arrondissements of Paris, its famous cafés and restaurants offered popular meeting places for the elegant elite throughout the 19th century. The sheer prettiness of the clothes of the 1830s make the highly ornamental fashion plates of this romantic era a delight to behold. A fashion plate is an illustration (a plate) showing fashionable styles of clothing. Fashion plates, as they were known during the height of their popularity, were first circulated at the end of the 18th century in England. These images do not depict actual or specific people but rather offer generalized portraits, intended to indicate the style of clothes that a tailor, dressmaker, or retailer could make or sell and/or to demonstrate how different materials might be made up into clothes. Through the centuries, the fashion plate has continued to provide a link between the wearer and the maker of clothes. Though fashion plates can trace their origins back to the 16th century, this method of disseminating fashionable styles remained popular through the 19th and early 20th centuries only to be largely superseded by fashion photography. 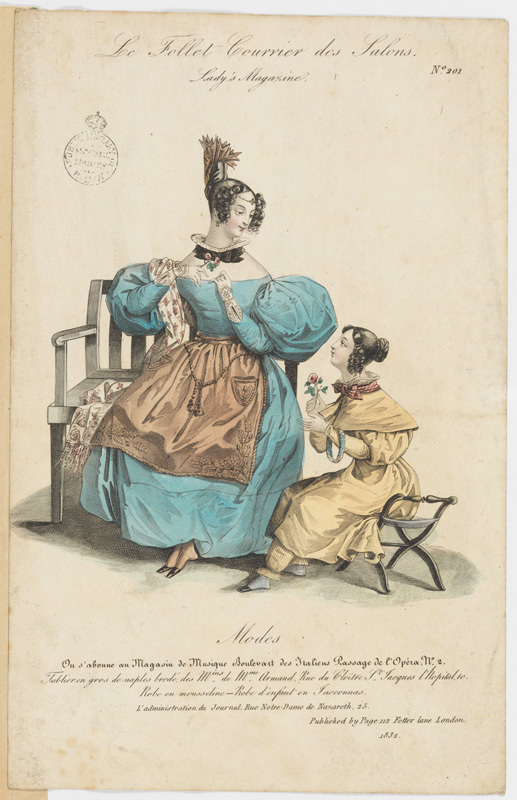 The Lady’s Magazine began publishing in 1770 and was one of the first distributors of fashion plates in magazines, spreading the trend across Europe. 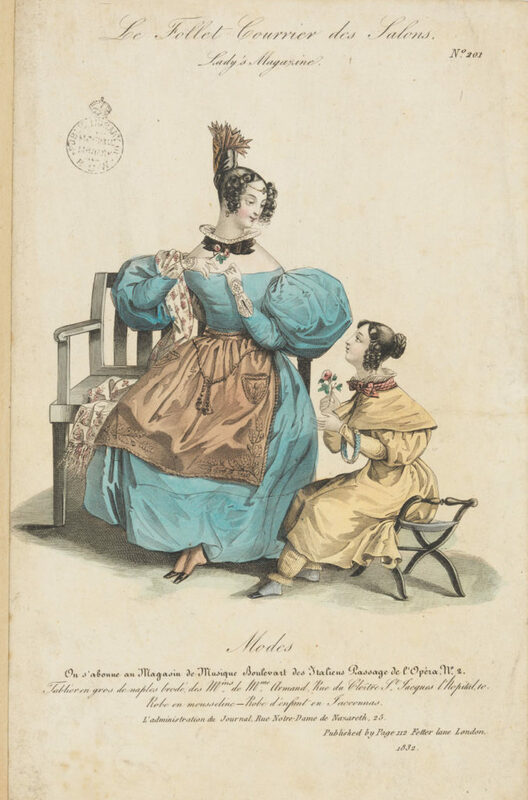 In France, La Galleries des Modes was a pioneer in fashion plate publication with magazines distributed irregularly during 1778 and 1787. After 1800 the increase in the number of lending, subscription and public libraries fostered a new reading public and many types of magazines flourished. Some magazines included illustrated fashion articles which were often their most attractive feature; fashion engravings, and later lithographs, were often coloured by hand. In 1809, the London print firm of Ackermann began to publish ‘The Repository of Arts, Letters, Commerce and Manufactures Fashion and Politics’. This magazine had a broad content scope with illustrations of good quality; a special feature of the Repository was the inclusion of small samples of new textiles which were pasted alongside the text which named and described them. Le Follet Courrier des Salons’, No.201, ‘Lady’s Magazine’, 1832. Modes – Tablier en ‘gros de naples brode’ de Mr & Mrs Armand, Rue du Cloitre St Jacques l’Hopital. Robe en mousseline – Robe d’enfant en Jacconnas.